4. Troubles with the U.S. relationship? Notably, despite a long military alliance with the United States and deep trans-Pacific economic ties, 62%% of Japanese name U.S. power and influence a major threat to Japan. Such public concern about the U.S. is up 10 percentage points in the past year. Young Japanese (68%) and women (67%) are more likely to see Washington as a major threat than older Japanese (58%) and men (56%). Nevertheless, a majority of Japanese (57%) hold a favorable view of the U.S. But this backing for America is down 15 points from 2016. Currently, men (61%) are more upbeat about America than women (53%). And three-quarters of Japanese (75%) voice a favorable view of Americans. Notably, Japanese who closely follow news specifically about the U.S. are more likely to have a favorable opinion of America (62%) than people who do not follow such news closely (45%). One reason many Japanese continue to hold a positive impression of America may be that nearly seven-in-ten (69%) say the U.S. respects the personal freedoms of Americans. And roughly six-in-ten (62%) name the U.S. as the world’s leading economic power. Japanese adults also express great trust in their country’s longtime ally. 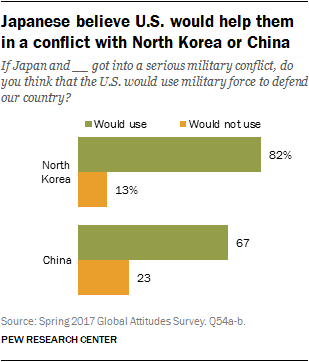 Two-thirds believe that the U.S. would use military force to defend them against China and eight-in-ten (82%) think Washington would stand with them in a military conflict with North Korea. But the Japanese have little good to say about current U.S. President Donald Trump. Only 24% trust Trump to do the right thing regarding world affairs, with men (32%) expressing twice as much confidence as women (16%). By contrast, an overwhelming 78% trusted Barack Obama’s international leadership in 2016. More than half (54%) of Japanese think the U.S. president is charismatic. And about half (51%) say he is a strong leader. 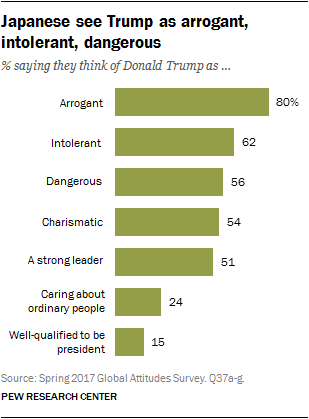 Yet majorities say Trump is arrogant (80%), intolerant (62%) and even dangerous (56%). This may help explain why just 15% of Japanese people believe that Trump is well-qualified to be president. Many Japanese disagree with some of Trump’s signature policy proposals. 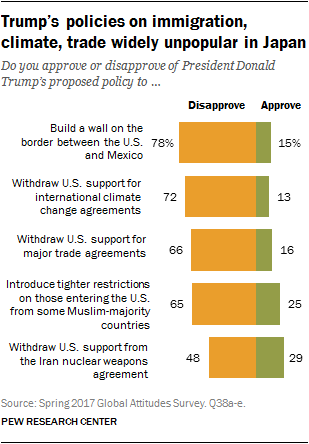 Nearly eight-in-ten (78%) reject the president’s desire to build a wall along the border between the U.S. and Mexico. Roughly two-thirds (66%) oppose his expressed desire to withdraw U.S support for major trade agreements. In addition, 65% disapprove of his plan to introduce tighter restrictions on those entering the U.S. from some Muslim-majority countries. Even before Washington pulled out of the Paris climate accord (which included Japan), a majority of Japanese disapproved of Trump’s plan to withdraw from international climate agreements (72%). Japanese views of the U.S. divide along generational lines. Roughly two-thirds (67%) of Japanese ages 18 to 29 hold a favorable opinion of the U.S., but only about half (51%) of those ages 50 and older agree. And it is older Japanese who are most likely to have lost faith in the U.S.: 69% of them held a favorable view of America just one year ago. Similarly, while 31% of younger Japanese have confidence in Trump, only 20% of older Japanese agree. Young Japanese generally hold more positive views of Trump’s character. They are more likely than older Japanese to say he is a strong leader and charismatic. Although they see him as arrogant, they are less judgmental than their elders. 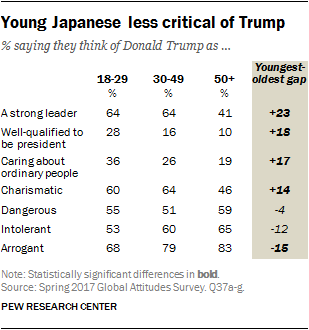 And despite their criticism, young people are nearly three times as likely as older Japanese to believe Trump is well-qualified to be president and nearly twice as likely to say Trump cares about ordinary people.